The ferritin test measures the ferritin blood level. The ferritin blood test measures the ferritin blood level. Why is a ferritin blood test important? The ferritin test checks ferritin levels to help check for iron disorders. This Ferritin Test is a blood test. The ferritin test, sometimes known as a ferritin blood test and a ferritin lab test, measures the ferritin blood level. Ferritin is a protein usually found in cells that plays a vital role in iron storage and metabolism. Found inside of cells, ferritin controls how much iron is released around the body and is a gatekeeper that prevents iron levels from being too high or too low. Ferritin also carries iron in the blood (albeit in low amounts) and is sometimes ordered with the iron test to get a better understanding of overall iron stores. Iron, by itself ("free"), is poisonous to cells. To store it in a safe way, ferritin is made by combining its precursor, apoferritin, with iron to serve as a storage form for iron. In this capacity, ferritin is a useful test in people testing for anemia. Ferritin levels in the body can be low because of insufficient intake or an increased iron metabolism. Ferritin levels are typically low in the setting of iron-deficiency anemia, ferritin levels will be low. Ferritin levels will also be low in vitamin C deficiencies, people who eat exclusively vegetarian diets and celiac disease. Ferritin levels have also been found to rise in conditions seemingly unrelated to iron. For example, ferritin levels rise dramatically when someone has certain types of infection or cancer as well as in the setting of low oxygen levels. High ferritin levels may also be indicative of possible excessive iron states (iron overload) such as hemochromatosis and hemosiderosis. To get a ferritin test near you, order online and get your blood drawn at the selected Quest Diagnostics lab. Once the ferritin lab report is ready, it will be available for download. No fasting is recommended before the ferritin lab test. 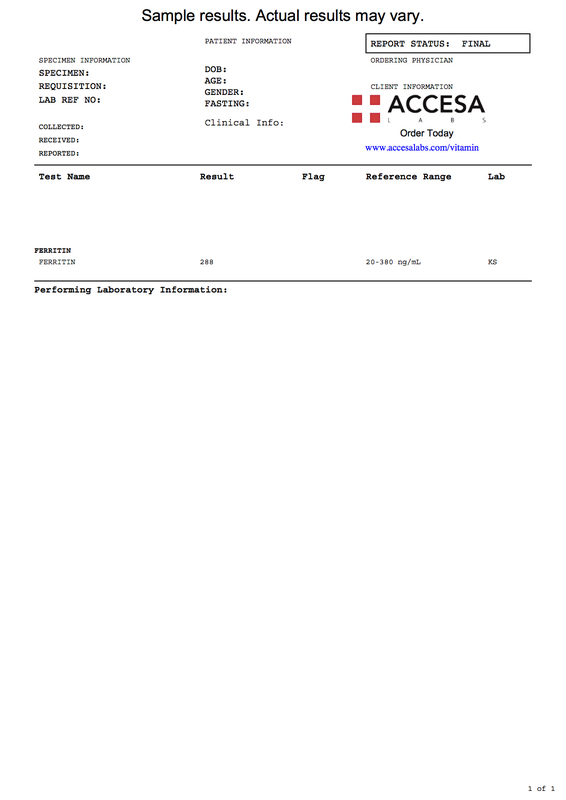 As can be seen on the sample ferritin lab report above, the ferritin blood level is reported as a number and can be compared to the reference range provided by the lab. For a more comprehensive iron level assessment, consider getting the iron blood test panel. The ferritin test is also part of the detailed mineral blood test panel. Ferritin Test at Guaranteed Prices.